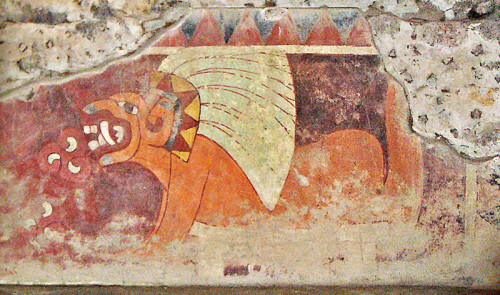 W3-0005: Jaguar Mural of Tetitla comprised of a snake headband with plumes of feathers emanating from it – thus providing the imagery of the famed feathered-serpent. 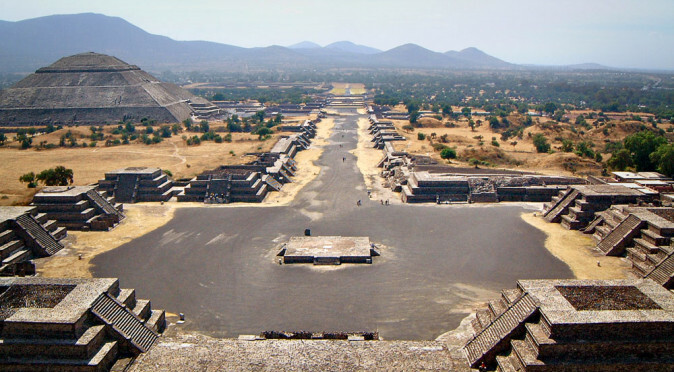 There are distinct differences between the two murals though, with the Palace of the Jaguars featuring upright ears, a shorter muzzle, a row of unusual orbs along its back that are thought to be shells, and a band of feathers above the eye that may symbolise the Teotihuacano owl. The Mural of Tetitla has the ear at the side of the head and features a much longer snout. It seems likely that these are different animals, with the smaller snout and upright ears being familiar to the Puma and the lower ears and longer snout being that of the Jaguar. W2-0019T: Tlaloc Above and around the mural in the Palace of the Jaguar are alternating motifs, one of which is probably a state-crown with plumes of feathers, obsidian mirrors and the icon of a mountain peak in the top-centre (this is very similar to the headdress worn by the Sower Priest of Techinantitla). 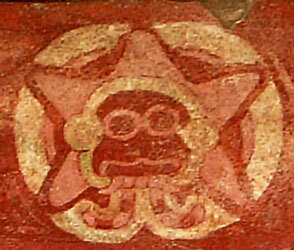 The other features a face mounted within a star, which in turn is mounted within a golden circle (fig. W2-0019T). 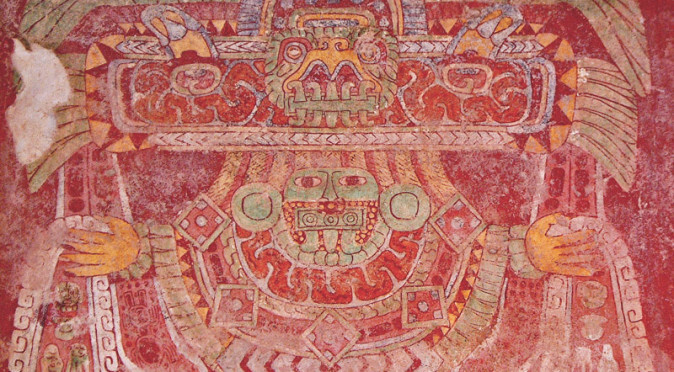 The face is unmistakably that of Tlaloc, with goggle-eyes, goofy fangs and serpents seeping from his mouth. The golden band is reminiscent of the two serpents found on the Aztec calendar stone and the bicephalic sky-band of the Maya, both of which are thought to relate to either the ecliptic path or the milky way. The common belief is that the five-pointed star represents Venus. 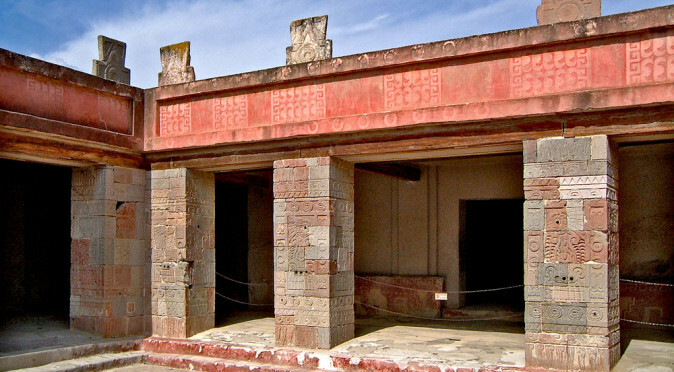 Therefore, the glyph most likely represents an association between Tlaloc, the bringer of water maize, and a Venusian event. 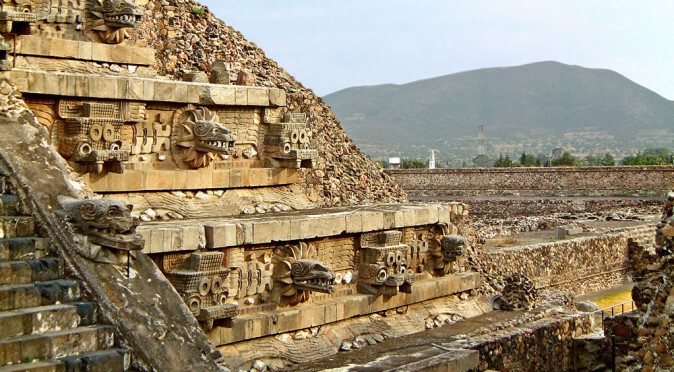 The glyph may also correspond to a date, or possibly an event, such as the beginning of a political era or the beginning of the fifth sun – which is thought to have followed an event that took place at Teotihuacan. W2-0020: Puma Mural Elsewhere in the Palace of the Jaguars, the imagery becomes even more perplexing with the introduction of the “netted jaguar” who sits upon a red serpent monster with a large curling red fang (fig. W2-0020). The outlined shape of this feline is clearly that of a puma or jaguar, but the body is made up of interlinking loops that represent a net. The netted jaguar wears the same headdress that is worn by the other jaguars, as well as the Great Goddess and her attendant priests (as portrayed at Tetitla and Tepantitla), which marries a snake-skin patterned headband with plumes of feathers. The netted-jaguar also has this snake-skin pattern running down its back, limbs, and tail, as though it is a serpentine monster wearing a jaguar shaped net – and this monster appears to be visible beneath the undercarriage of the jaguar. Images of priests wearing nets are found elsewhere in Mesoamerica and are thought to symbolise a transcendent state, where the priest is taking on the persona or form of the creature portrayed by the net. 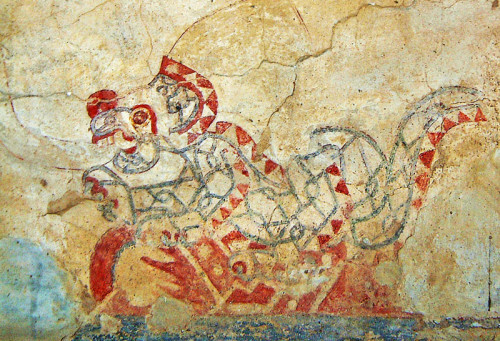 Accordingly, this unusual image at Teotihuacan could relate to the fire-serpent, who seemingly wears the netted jaguar on his head, taking on the state of the jaguar/puma that is clearly central to the Teotihuacano identity. 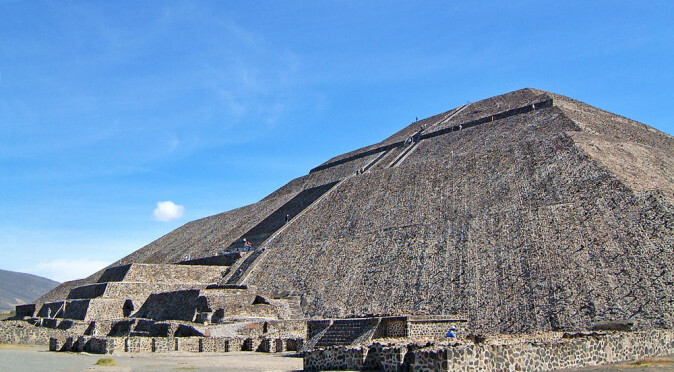 However, nets were also mounted upon observatories and pyramidal structures to enable the observers to create star maps and track celestial movements. Observers would look through the net and use it to provide a grid for them to record coordinates against. So this image of a netted jaguar may actually describe an event that involved a constellation symbolised by the jaguar/puma and another celestial body that was symbolised by the red fanged monster on which the netted jaguar rests. 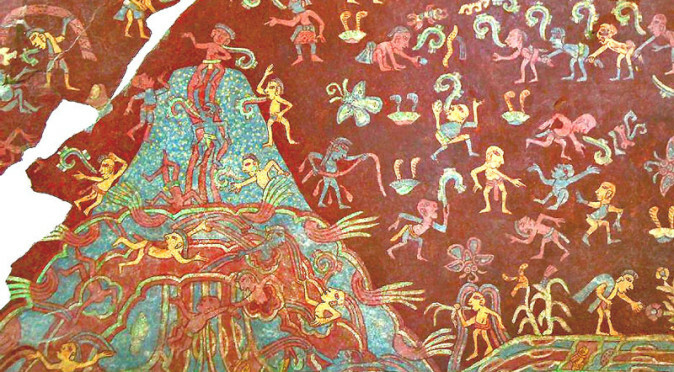 This would be in keeping with other murals in the Palace of the Jaguars, which feature iconography that relate to celestial events. 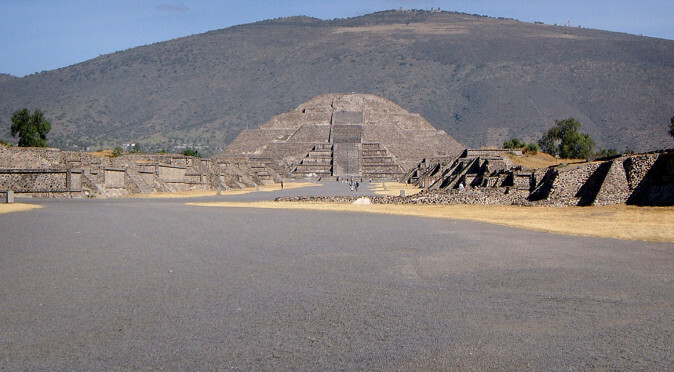 The Palace of the Jaguars’ proximity to the Pyramid of the Moon suggests that it was of supreme importance, but, as often is the case, the Teotihuacano artwork found painted on the walls is so cryptic it presents more questions than answers. 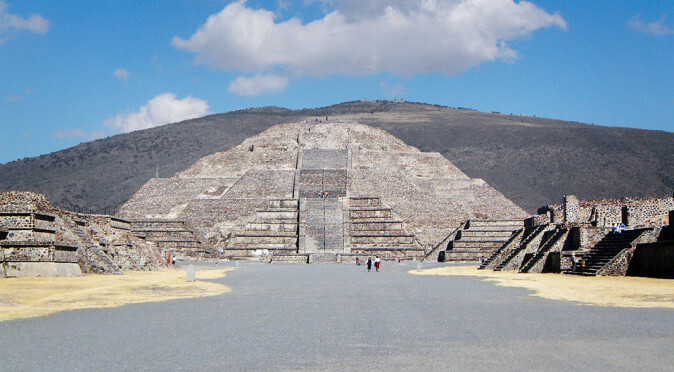 With themes of transcendence, astrology and conquests, and with the Palace of Quetzalpapapotl immediately next-door, it seems likely that this was a place where elite warrior-priests convened and planned rituals that were carried out in the Plaza of the Moon and conquests far beyond. Nice article, interesting subject, thanks!